We’re trying something new here at ShopStorm: We’ll be picking one helpful app a month to review on our blog. This is our first edition! Promotions, flash sales, and discounts are a good way to clear out inventory and increase your sales. 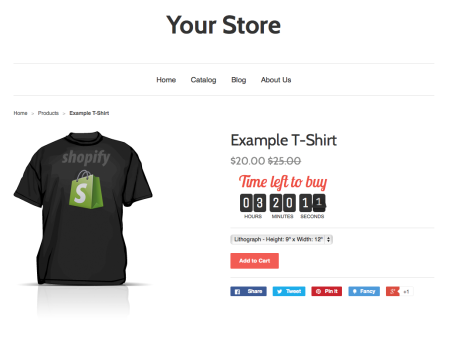 Your Shopify store comes out-of-the-box with the ability to provide discounts through promo codes for your products. You can select a discount as a dollar value or a percentage off of the original price of a product. But you may want to give customers different discounts based on specific products (or product variants) or deals for only a certain time-period after which these automatically expire. Enter the Daily Deal app. The Daily Deal app by Grizzly Apps lets you create promotions for different products and collections. The app embeds a countdown timer to visually represent the duration of the deal. You can set up deals based on different products or collections, and even set time-based promotions, for example, during busy hours, weekends, holidays, etc. The app doesn’t simply reduce the price of the products, but also clearly shows how much customers are saving on the product. This, combined with a countdown timer running towards the expiry of the deal, creates a sense of urgency that can boost your sales. By giving you access to all your deals from one dashboard location, the app makes it easy for you to conduct A-B testing. That means you can try different types of deals on the same product at different times, or similar products at the same time to see which one gains more sales. This can give you feedback about what your customers want and what gets them to make the purchase. You can choose to embed two types of countdown timers – Flip Countdown and Circle Countdown – that are mobile-ready and can be customized to fit your store branding. Install the Daily Deal from the Shopify App Store and go to the Grizzly Apps page to create and manage your promotions. 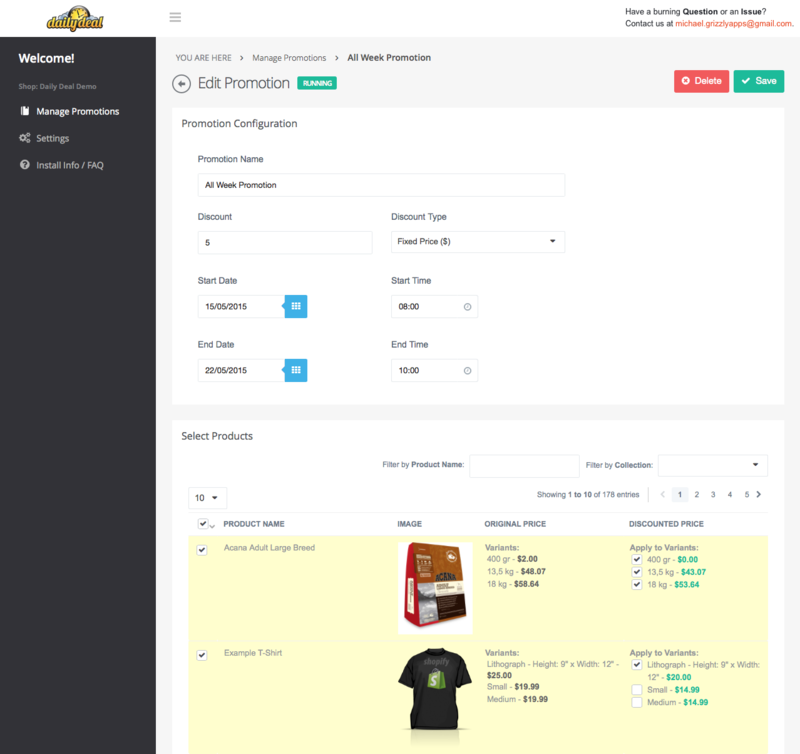 The Manage Promotions page in the app shows you a summary of all the deals that have been configured for your Shopify store. This page also provides you information about which deals are currently running, those that are queued for a future date, and those that have already ended. 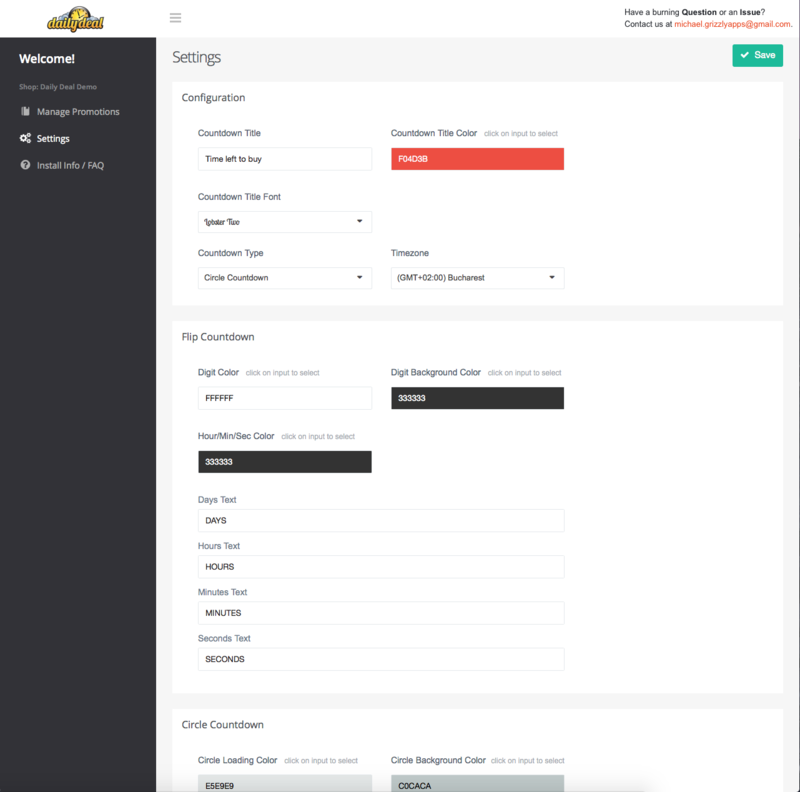 Once the deals are configured, you can run or pause them instantly, and reuse them again for future dates. Click on the blue Edit Promotion button under Actions to change and set configuration for that deal. the products and variants that the deal should be applied to. Lastly, the Settings page in the app allows you to configure the style of the countdown timers that can be adjusted to your store branding. Provide deals to your customers to increase sales and effectively manage your inventory. With the Daily Deal app, you can set recurring deals on different products. The app embeds a visual and mobile-ready timer on your store to create a sense of urgency with customers that impacts buying behaviour. 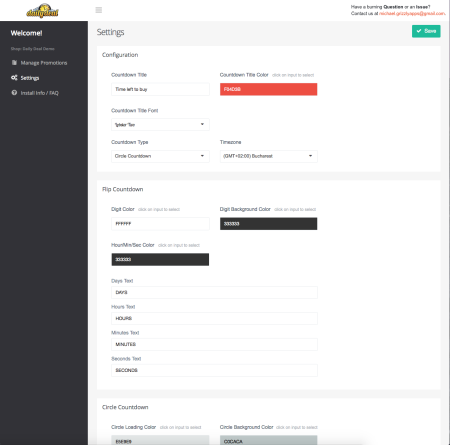 You can set different deals at one time and manage them from one single dashboard. This allows you to set up deals on items you want to clear from your inventory or ones that have the biggest margins so that the deal still maintains cashflow. Get started by setting up at least a single deal and customize the countdown counter to match your store branding. That will allow you to test how your customers behave with different discounts on different products. Tell us your experience with daily deals in the comments below.